Meeska Mooska Mickey Mouse is a frequent sound in our home. The Littles loves her some Mickey. So when it came time to celebrate her 2nd Birthday there was no question how we had to celebrate. Not wanting to go the standard store bought route (nothing wrong with that) I went polka dot crazy & created a fun themed birthday with some character (& characters). I mixed some homemade pinwheels with store bought to give it a more personal touch. I followed this tutorial when creating my own, although I used long sheets of wrapping paper. I grouped them the way that I wanted & glued them to a poster board to make the arrangement one piece. “We’ve got Ears. 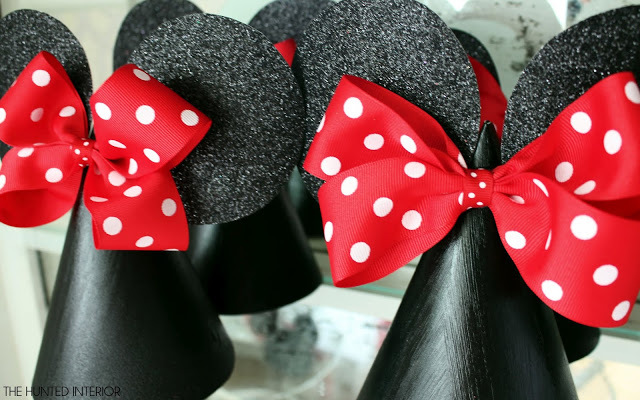 Say CHEERS!” Incorporating some Ears are a must for any Mickey/Minnie Party. I painted some Party Hats black. Can nobody sell plain hats?!? Than I hot glued on some glitter paper ears & of course the classic polka dot bows. 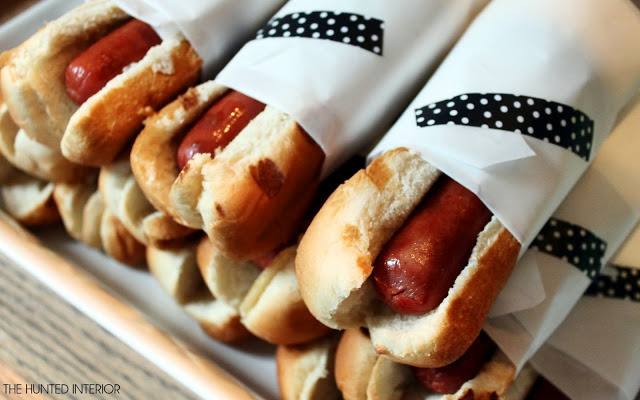 To dress up the “Hot Diggity Dogs”, we wrapped them in parchment & finished them off with a little washi tape. Our Banana Puddin’ got all dressed up for the occasion with a bow. Our Minnie Moo Muffins were simple!!!! 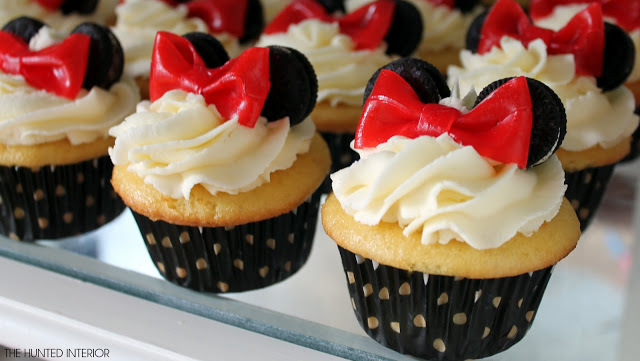 Vanilla cupcakes with vanilla buttercreme topped with two mini Oreos & finished off with a bow made from…. Fruit by the Foot… Yes, that stuff you used to eat in elementary school. Our Lemonade was served in our Minnie Dispenser. The Hubs came home with this weird plastic orb dispenser a while ago… Not very glamorous. I never really knew what to do with it… but for some reason I thought Minnie! I glued some ears & bows & wouldn’t you know, it was pretty cute! Our cake came from Miss Mamie’s Cupcakes (Cupcake Wars Winner People!!) Not only was it absolutely adorable, but I think it tasted even better. Red Velvet seemed appropriate. Ears just seemed to Minnie-fy everything. 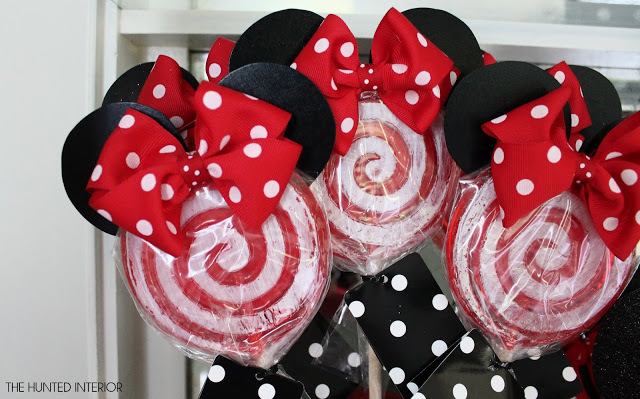 Simple Red & White Lollipops were transformed with their new accessories. ***Update: I wish I knew more about the Ears & Bow… all I know is that the ears were cut from 3/4″ scrap rubber. They were screwed into the car on the underside of the roof. The bow is constructed from a piece of plexi glass that was painted. This was attached to the ears with a high adhesion waterproof glue. I can’t believe she’s Two… but we all had fun celebrating. Now that the party is done, I can get back to my regular projects. We’ve been busy! Update: After three years, we finally made it to Disney to meet Mickey & Minnie! You can read about my tips & tricks about visiting Disney World here. never anything less than stellar! Wow!!!!! You really outdid yourself!! Everything was done with style and pizzaz!!! I absolutely love it and I'm sure the little celebrant and her friends were ecstatic!!! Did you give the lollipops as give-aways? I betcha, years from now, your little daughter will appreciate this evermore!!! Great job! You always amaze me! Great job girl!!!!! Amazing! Everything about this party is absolutely brilliant! This party is adorable! So many great ideas. so so cute! love everything! Adorable!!!! Love all the details!!! 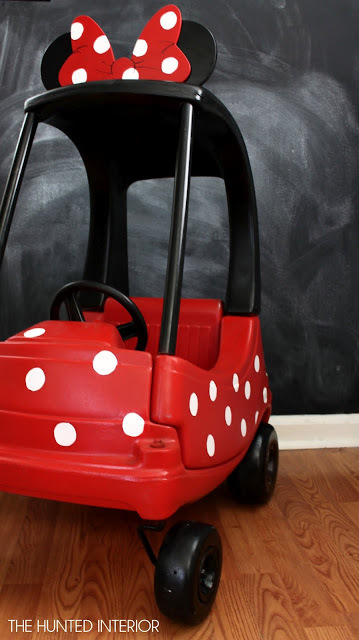 So adorable and the minnie mobile is genius! I'm glad I discovered your blog through The Mustard Ceiling. Can't wait to read more! Would you mind telling me what kind of paint was used to spray the mini coupe car? This is so absolutely darling…I'm totally a sucker for a little ruffled rear, too! So adorable! Hopped over here from The Mustard Ceiling and she is *SO* right, you are a DIY genius! Looking forward to stalking you, my dear! This party is oooozing in adorability! So precious! Great ideas! Super cute! I love all the attention to detail – even the drink container! That made me smile! Great job! WOW!! This party looks fantastic! My two year old daughter is VERY into MMC right now, I wish I had the time to put something like this together. Your daughter is very lucky!! She make these ears for the top of the car? Or did she buy them? A pattern or tutorial for the ears and bow would be fabulous! This looks wonderful! I wish I could provide a tutorial… this is all I know about the ears. They were made from 3/4" rubber (they were actually scrap rubber on a farm) & the bow was cut from plexi glass. They were attached with a waterproof high adhesion glue & screwed into place from the inside of the cars top. Wish I had more answers… Hope this helps. I would love to know how she did the ears for the car? Trying to find the perfect gift for my daughter and I may have just found it!! Holy cow! Cutest. Party. Ever! I found your blog over at 6th Street Design School. You are so very talented!! This is absolutely precious. The car. . . dying. I love your home and style. Also found you through 6th street. Amazing!! The cupcakes and the hats are soo adorable! Your mom needs to do a tutorial on that car! Everything is just amazing! You inspire me. Yes please! Please ask if they would do a tutorial for the car. I can also tell that they have modified the car with the poles on the front connecting the roof and the car itself. I'm about to start getting what I need to make this for my daughter and would just adore the info! There will not be a tutorial as this was a one time deal 🙁 The car has not been modified, it was just a very old model picked up at a yard sale. It was spray painted red & black (as the older colors had faded) & the ears & bow were cut out of spare rubber. I believe the same thing could be duplicated with wood. Painted. & then screwed into the roof from under the roof. I hope this helps. IF they would have been local I would have totally made a tutorial… but the car came from 9 hours away. I am having trouble making the bows for the cupcakes with the fruit by the roll. HELP. Sorry you are having trouble! Here is a link to how Martha Stewart makes them out of fruit roll ups… Same concept. Well done..bravo! 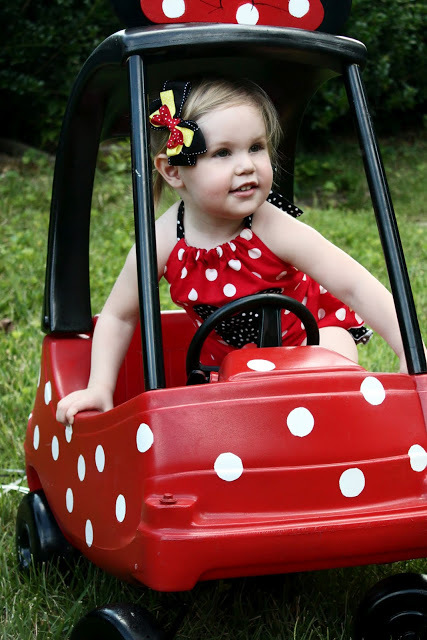 My grand-daughter will be 2 in October and loves Minnie as well! them? 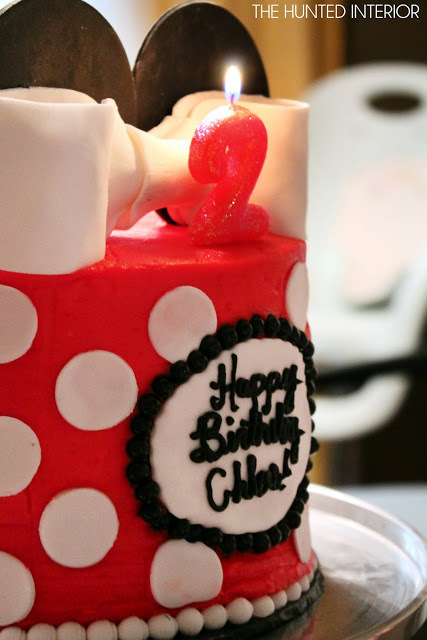 I am dying to make some like this for my daughters second birthday!! You did a great job!! It is absolutely PERFECT!!!! And the cozy coupe makeover is adorable!!! Thanks Nicole! I used a black glitter cardstock from the scrapbook section of the craft store. It was thin enough to easily cut, but thick enough to hold it's own. I hot glued the ears to the bow & then the bow/ears combo to the hat. Hope that helps! LOVE your birthday party! My baby girl loves Mickey Mouse Clubhouse and your blog captured everything I was thinking of- and more! Adorable. What are the goody bags made of? Those are cute! Was just looking for ideas for my daughter's 2nd birthday. I've never been big into character themed parties, but this has totally changed my mind! 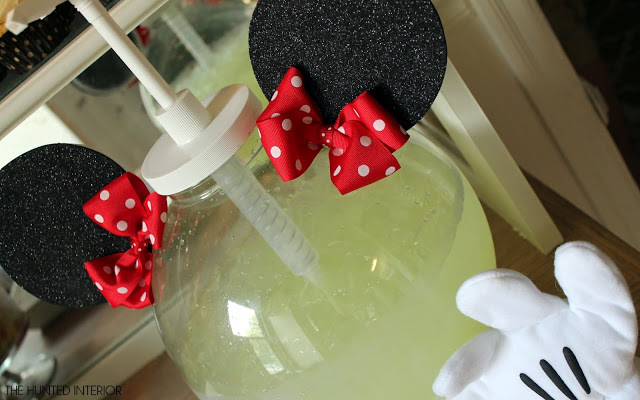 My daughter loves Minnie, so I will definitely use some of these ideas for her party. Thank you! I was just looking for ideas for my daughter's 2nd birthday, and came across your site. This is adorable…I've never been big into character themed parties, but this has totally changed my mind! I will definitely be using some of these ideas for her party. Thank you so much for posting this! 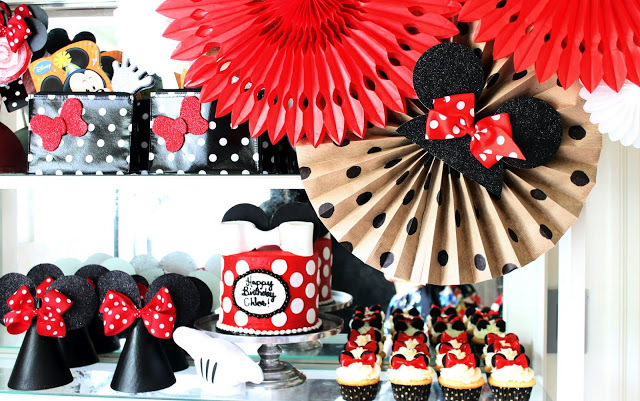 The Mickey Mouse theme is indeed an all time favourite when it comes to a kids birthday party. You have planned a great motif too, from the games to the food. Two thumbs up for you. I have been looking for ideas for my little girls birthday coming up in January. 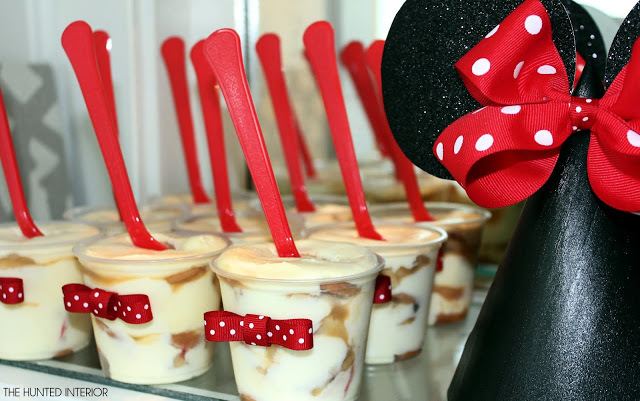 Did you do any fun games or activities at the party themed with Minnie Mouse for the little ones? The guests were all younger, so organized games were not planned. I was meant to find you on pinterest! 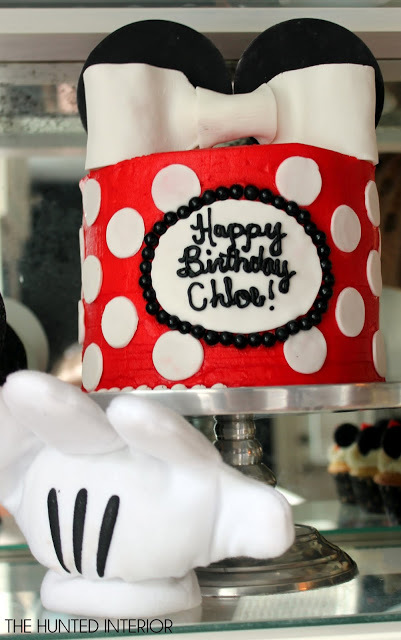 my daughter Chloe is turning 2 in a couple weeks and I've been looking for Minnie mouse ideas because that's her latest obsession! I love your invitations and her romper and the food and the car! I found a car on craigslist really cheap and totally copying that idea haha thank you Soooo much for the inspirations! I hope mine comes out at least half as good as yours!! I love these ideas and will be using at my daughters 2nd birthday party coming up, i was wondering did u make the banana pudding in the cups or make on big pan and scoop some in each cup? also what did u put the popcorn in for each child, i didnt see a picture of that. Thanks for the inspiration. oh one more thing and this may have already been asked but what did u paint the party hats with? Thanks Mayluv. The banana pudding was created in a large bowl first & then portioned layering in some mini vanilla wafers. The popcorn was simply served in a large bowl… nothing fancy. & the Party Hats were simply painted with black spray paint I had lying around… I hope that helps. 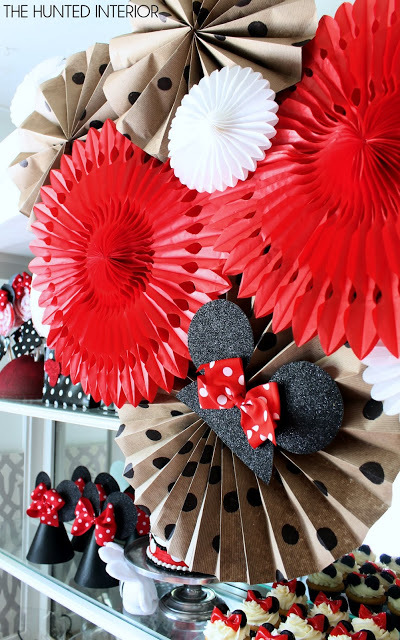 Ah, the ultimate Minnie Mouse theme is always a good choice. The celebrant herself is as cute as the character. Kudos for a fun-filled party! 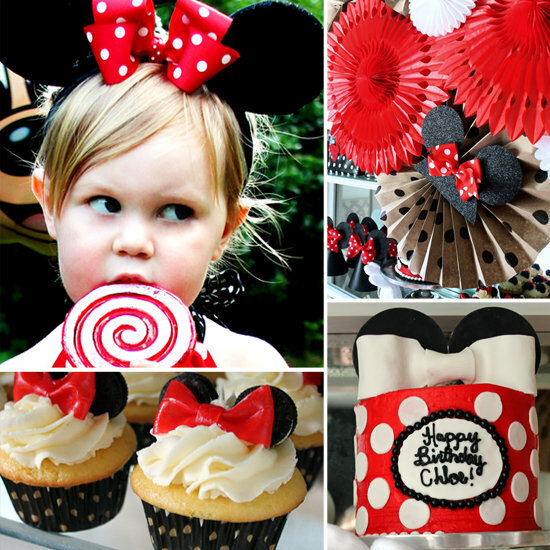 I am planning a Minnie party for my daughter's 1st birthday and I absolutely LOVE your ideas! From the decorations to the food! How did you prepare the hot dogs and keep them warm? I would love to use your idea of wrapping them in paper! Terrific! Can you provide how the invitations were done. I created them in Photoshop & Illustrator, but have seen similar templates on Etsy. I believe I Spray Painted them… either that or brushed on some black acrylic craft paint. (I don't remember! :) Oops!) Good Luck! Your daughter's party looked amazing! Thanks for sharing all of your ideas and inspiration. Question re: the cupcakes. Did you put the bows and oreos on the day of? I ask as I am making these for my 5 yr old's party on Saturday. I am making the cupcakes Friday night, but don't know if the oreos or fruit leather will bleed into the frosting. I made a mock-up tonight just to make sure it looked okay, but the sample got eaten. 🙂 Thanks! They did not bleed!! I was worried about that as well ;). Good luck!! I believe the wrappers came from Party City… Definitely something I picked up at a local store. No special trip or order. The polka dot bags were makeup bags from the dollar aisle at Target. I simply added a bow & a few Mickey themed toys on the inside. How did you make the pinwheels they are too cute? Thanks! I used this tutorial that was linked in the post 🙂 They were really easy! I love the bows! Do you just know how to make them or is there a tutorial for these?? 🙂 Actually my mother taught me how to make hair bows when I was a child, so this is just something I know how to do. Try searching hair bow tutorials & something will come up. This is a really basic technique that there has to be a how to on! Good Luck. Beautiful! The pinwheels and party hats are super cute! 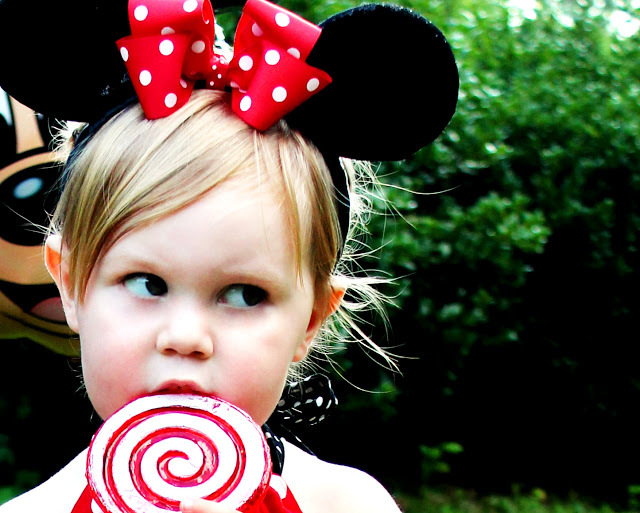 what did you use for the ears on the lollipops? Also what did you use to attach the ears and bow to the plastic? Black card stock cut into circles & they were attached with hot glue I believe… It was over a year ago, so I don't remember that specific application. Love this so much! Amazing Job! Do you sell your template? I do not find anything on Etsy that is as classy as yours. "Oh Boy!" what a fantastic party! Love the Cozy Coupe! Where did you find the lollipops? I am searchIng for a decent size to try to make them like yours and the best I can find is 5". We are getting ready to update our 30 year old Cozy Coupe and were wondering how the paint has held up? I'm gonna suggest this to my friends! compilation. thank you so much!! 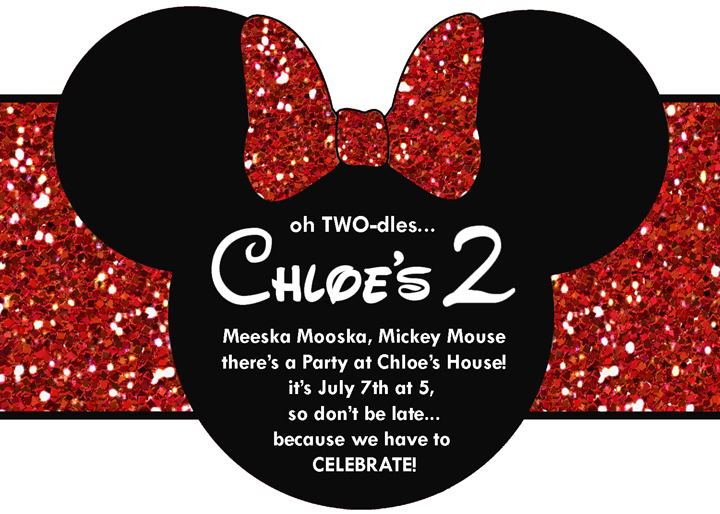 Super cute little girls party! I however have a super sweet little boy that is having a "soccer" birthday in a few weeks. I LOVE how you've done your hot dogs and would like to utilize what you've done. Question for you…..how long in advance did you prepare them? And how did you manage to keep them warm and yummy preparing and wrapping in advance. Please let me know 🙂 thanks so much! really grateful for your blog post.